When contemplating the question, “What do we do now?” it’s helpful to have the perspective of decades of working for peace, justice and the environment. Peaceworks, which we organized here in CoMo 36 years ago, in January 1982, as a Nuclear Freeze group, benefits from the perspective of time. There are many new challenges facing us under the Trump administration, yet many of our concerns predate Trump by decades. Moving forward we need to address the immediate crises and also remain engaged around root issues. The toxic Trump agenda is an assault on everything good that government does. They’ve tried to deprive tens of millions of healthcare. They’ve rolled back environmental, workplace and financial services protections, as they push to deregulate everything. They’ve also scapegoated immigrants and Muslims, attacked transgendered people, and appointed some of the most reactionary and incompetent jurists imaginable. They’ve attacked the free press, science and public education. And they’ve pushed through an outrageous Tax Scam bill that will dramatically cut taxes for corporations and the wealthy, while adding hundreds of billions to our annual deficits, leading to further cuts in programs that provided needed services. Medicare, Medicaid and Social Security will all be on the chopping block. While these actions, and many more not detailed here, have increased our sense of urgency, the most critical issues we address have been with us from the start and throughout the years under both Republican and Democratic administrations. They are still with us. This includes the Permanent War Economy, which empowers and enriches the Military Industrial Complex, while impoverishing all of us and extracting a huge cost in life and limb. Perhaps the most dangerous portion of the militarist mindset has been the complete unwillingness to even address the need to abolish nuclear weapons, an existential threat that is routinely ignored. And the logic of nukes-in-perpetuity leads directly to proliferation and the threat of these weapons being in the unstable hands, be that Kim Jong Un or Donald J. Trump. The other existential threat that has for decades been inadequately addressed by both Ds and Rs is the Climate Crisis. While President Obama paid lip-service to the issue from the start, he also wanted to be the “all-of-the-above” president and supported fracking, off-shore drilling and other extreme fossil fuel “development.” It was only in the last two years of his administration that he began to move forward on the critical issue of ending our reliance on fossil fuels. Trump, on the other hand has completely embraced the dirty energy agenda of the fossil fuel industry, appointing deniers to critical regulatory positions, rolling back regulations, opening public lands to drilling, killing the EPA Clean Power Plan and withdrawing from the Paris Climate Agreement. 2017 has been a very challenging year for Peaceworks. In addition to our usual issue work, focused primarily on climate, peace and sustainable living, we’ve embraced organizing—in collaboration with our progressive allies throughout the community—to challenge and oppose the Trump agenda more broadly. This has involved taking the lead, or taking a collaborative role in organizing events like the huge Solidarity Rally in conjunction with the Women’s March, the March for Science, the March for Truth and many other demonstrations focused on healthcare, the Tax Scam and more. Recognizing the need to collaborate and provide mutual support is essential to the political moment. We need to be there for the LGBTQ community, for Muslims, for immigrants, for people of color, for the working poor, for those whose civil liberties and reproductive rights are under assault, for family farmers . . . the list goes on and on. We also need to be there for those whose lives are being ravished by extreme weather events exacerbated by climate change; and for the innocent people around the world who are on the receiving end of bombs made in the U.S.A.
Our work at the moment involves doing something Peaceworks has done for decades, building alliances and coalitions. 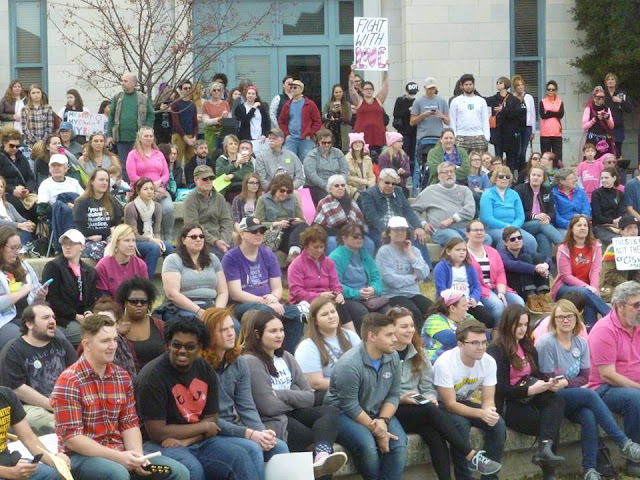 We are working right now with our allies in the Mid-Missouri Solidarity Network to put together what we hope will be a very large Resistance Rally and March on Saturday, Jan. 20, the one-year anniversary of the Trump inauguration and the Women’s March. While we need to build coalitions and lend support, our work on a day-to-day basis needs to be more focused. And to gain real traction we need to focus on educating, agitating and organizing around our core issues. As noted above, the primary foci of Peaceworks’ efforts are centered on addressing the climate crisis, opposing endless war, militarism and the threat of nuclear war, and educating our fellow citizens as to options to create more sustainable ways of living. We educate in each area. We hold public events and programs. And we do public advocacy to attempt to reach both opinion leaders and decision makers. The shape of this engaged activism is varied. It includes putting together informational events including speakers, films, panel discussion and events like the Sustainable Living Fair. It includes putting together large gatherings with an informational component, most notably Earth Day. It also involves a variety of public demonstrations from our weekly Rush Hour Demonstrations to big events like the Solidarity Rally last January that drew upwards of 3,600 people. We also have an active on-line presence, with several issue-focused pages on Facebook as well as our Peaceworks blog. We write op-eds and other opinion pieces that we share widely. We print and distribute newsletters and leaflets. We also regularly engage our elected officials on the issues that concern us. We also are actively engaged with local government working with City of Columbia officials to move forward CoMo’s first Climate Action and Adaptation Plan (CAAP). Peaceworks Sustainability Coordinator Laura Wacker addresses the CoMo City Council regarding the CAAP. Our efforts are multilayered. On one hand we would like to see those in decision-making positions start to make better choices. To get them to do this, we need to educate them and show them the feasibility of taking different paths. At the same time, we need to educate our fellow citizens and get them to both understand the issues we’re working on and to recognize the importance of taking action on them now. Getting more citizens on board means ultimately creating the pressure to influence decision-makers or to see the electorate replace those currently in office (note: while many Peaceworks members, as individuals, are involved in electoral politics, as an organization, Peaceworks does not support, endorse or oppose candidates). The sort of movement we aim to build is first and foremost grassroots and participatory. And, recognizing that the problems we’re addressing won’t be solved overnight, we are in it for the long haul; not months or years, but literally decades. What we aim for is sustainable activism; participation that fits into one’s life in a viable fashion for the long haul. There are literally dozens of ways to get involved. We need folks to participate in demonstrations, to write letters and op-eds, to meet with elected officials, to do research, to prepare and deliver presentations, to help with outreach for our speakers bureau, to help reach out to individuals or groups in other mid-Missouri communities besides CoMo, to help teach classes, to help organize and orchestrate events, to staff outreach tables at events, to help with fundraising, to paint signs and banners, to contribute original artwork, to help with our IT needs, to serve on programmatic committees (Peace & Justice, Climate Action and Sustainable Living), to serve on our Steering Committee. This is just a portion of the list. As you can see, opportunities for involvement are diverse and can be tailored to your interests and talents. If you are interested in helping build a movement that’s in it for the long haul and committed to making to-the-root change, we are interested in working with you. Please feel free to e-mail us at mail@midmopeaceworks.org or to call us at 573-875-0539 (ask for Mark or Laura) to discuss options. Moving into 2018, we are pumped. It is hard to overstate how pressing our issues are. If you share our sense of urgency and are ready to work with us to move things forward we are most ready to work with you. Working together we can do so much more than we can as individuals. Please join us!